Choose Amici's Catered Cuisine for your next special event and enjoy freedom from planning, coordinating, and everything in between. Our caterers take care of every detail, including food, decorations, vendors, and more; just let us know what you need us to handle. 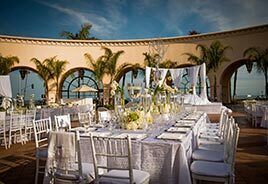 When it comes to event planning in Tampa Bay, FL, no catering staff is more trusted or preferred. Choose Amici's Catered Cuisine for your wedding and allow us to show you what we can do on our next Date Night. Just complete an RSVP form and we'll contact you with the details! Enlist our company’s help with wedding catering. Discover the difference our delicious wedding food can make on your most important day! Take advantage of skilled corporate caterers. Reach out today to request our help with corporate event catering at your next big event. Enlist our company’s help with delivery catering, or take-out service. Discover the difference our delicious food can make during your event. 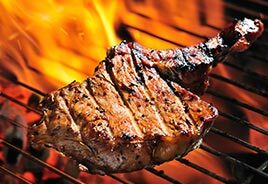 Ask about your options for BBQ catering. Learn what our company can do for you when your special event needs professional outdoor catering. 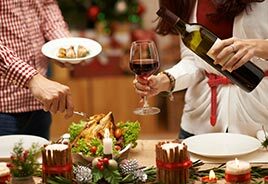 Choose our company when you need professional and delicious holiday catering. We offer graduation catering, quince catering, and more. We Specialize in Private Home Parties for Any Occasion! Are you searching for catering companies in Tampa that offer exceptional customer service and divine cuisine options? Look no further! For more than 34 years, Amici's Catered Cuisine has cultivated a reputation for excellence. Today we're the leading provider of event catering in St. Petersburg and other surrounding areas. We'll bring the finest quality gourmet foods, deliver impeccable service, and dazzle you with spectacular presentations! 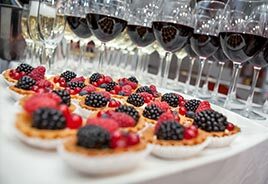 Whether you are looking for an extravagant menu for your wedding, hosting a corporate dinner for your employees, or wanting to impress your friends with delicious Hors D'oeuvres at a cocktail party, the specialists at Amici's Catered Cuisine are here to make your event a success. We take pride in helping our clients achieve their dream parties and events. Although we offer a wide variety of cuisine options to broaden your palate, our services do not end there. Our team ranges from caterers to event planners to help you with floral arrangements, decorative touches, selecting menu items your guests are sure to enjoy and much more. Look to our Tampa catering company to assist you in all your event planning needs. Since 1983, our company has remained a trustworthy, off-premise caterer for many different clients, both residential and commercial. We can help you make your event a raving success, so let our staff handle all the work while you sit back, relax, and enjoy the party! Event planning is a daunting task for most people. However, it's easy to coordinate any special occasion when you work with a catering team that cares about your requests. Our party professionals will work with you from start to finish, guiding you throughout the entire process. You can place your trust in us, as our talented team is eager to do whatever it takes to make your dream event a reality! 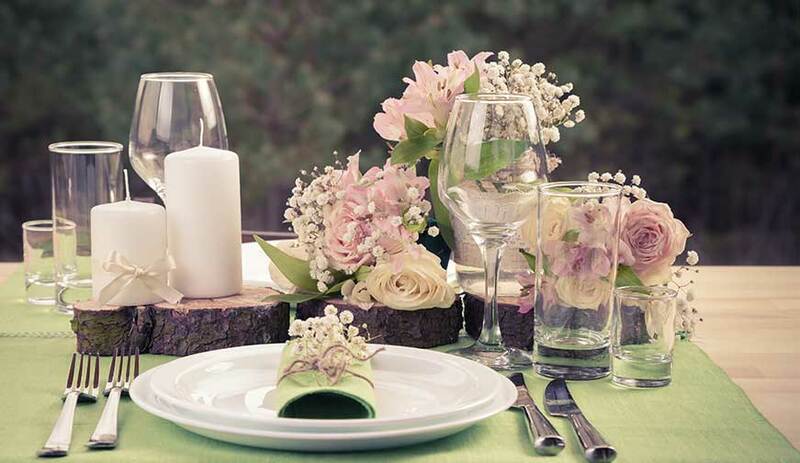 Weddings: As trusted local caterers, our team will work closely with you to create arrangements that touch on every request you make, from the big picture to the tiniest detail. We can assist with a variety of auxiliary services, including entertainment, tenting, d'cor, transportation, signage, security, floral, and linens. Check out our wedding menu for a full line of dining choices, from palate-awakening cocktail hours and elegant sit-down dinners to towering wedding cakes, sumptuous dessert stations, and grand ice sculptures. Personal tastings are available by appointment. Corporate Events: Catering is an art form that combines culinary passion and the success of each and every event. Whether you want a cocktail reception, buffet lunch, or seated dinner, we execute every detail with special care, ensuring you and your guests are able to relax and indulge. An attentive wait staff, captivating cuisine, exquisite indulgences, flawless execution, and warm hospitality are our hallmarks. Other Special Events: Amici's is thrilled to mastermind the style and ambiance of your event with sophisticated, alluring pieces that create memorable impressions. We handle every facet of your event with a personalized touch. Feel free to dream big and dream often, as we can deliver just about any special touch you wish. We specialize in creating atmospheres and experiences unique to your aspirations. Our professionalism, commitment, and expertise let us accommodate events of every size and scope with decorations that complement your menu. Contact our food catering team to learn what we can do for your special event. We serve clients throughout Tampa Bay, Florida, and the surrounding areas. Allow the professionals at Amici's Catered Cuisine to lend their expertise to your upcoming wedding or special event.Contact us at 813-855-1100 or send us an E-mail. From start to finish, they were PERFECT! You can tell when someon truly loves what they do and the entire staff was AMAZING to work with. Food was spot on and we could not have been happier. From start to finish, they were PERFECT! You can tell when someon truly loves what they do and the entire staff was AMAZING to work with. Food was spot on and we could not have been happier. - Steven D.
On Behalf of my entire family, I want to thank you and everyone involved at Amici's for making our family event yesterday fantastic. You all FAR exceeded our expectations in terms of quality and service. Everything was absolutely perfect! The ham was remarkable; many guests asked me where we got it and said it was the best ham they'd ever had.. And we are ham snobs, as my husband, who hails from Kentucky, normally BBQ's our Easter and Christmas hams and he was prepared to be disappointed. Not! In this day and age, where people are so quick to criticize and so slow to recognize great performance, I wanted to make sure that you and everyone at Amici's knows how absolutely thrilled we were with the service and food. You truly made my husband's big day special, and for that I am extremely grateful. 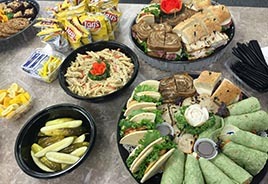 When attempting to pick out a caterer, I was a little overwhelmed as there are a lot of caterers in the Tampa Bay area. My venie highly recommended Amici's so I decided to go in for the tasting. We were really impressed at the tasting, but the thing that really sealed the deal was the fact that they had rissotto as a starch option, so we signed up! Amici's was really easy to work with and was very responsive throughout the planning stages of the wedding. We had some menu changes and they had no problem with this. Onto the wedding day. I got so many compliments from my guests on how GREAT the food was and I couldn't agree more. They made sure to bring appetizers over while my husband and I were taking pictures and the banquet captain was made sure that the groom and I were taken care of at the reception. Over all, I would really recommend Amici's. They are a professional and delicious caterer! We consider it our privilege to help you understand all your needs in making a successful event. Our party professionals will work with you from start to finish and will guide you through the entire process.You can place your trust in Amici’s Catering, simply because our talented team is eager to do whatever it takes to make your dream event a reality! Allow the professionals at Amici’s Catered Cuisine to lend their expertise as a top Tampa Bay Caterer to your upcoming special event. Contact us by calling 813-855-1100, or email us here.